The result of our latest poll confirmed what we thought all along - you wanted more information about individual makes and models of old lawn mower. We already had quite a lot of information available on the website but we knew that it was not always easy to find. On top of that we've never been completely happy with the way the information was presented. While the poll has been running over the past couple of weeks we've been updating the way much of our information is organised and how this is presented. The first results of these changes have been made today. First, you can now browse a complete list of all of the individual mowers for which we have information such as dates, engine settings, colours, operating manuals, profiles and more. This new section will be available under the Lawn Mowers menu on the left hand side of the screen. At the moment it mainly draws together the information that was already available on the site but presents it in a new way. An individual mower's page is now central to the way we store information and provides links to other pages that are relevant to that machine or manufacturer. We have a lot more mowers (and information) to add in the near future and this section will grow into a really big part of the site. Second, we have revamped the existing pages for the Mower Settings and the Mower Colours. The way this information is organised has been completely revised which has involved quite a bit of work behind the scenes. Some of this information is now available to non-members of the club for the first time. The changes to the site address the demand for more information about individual makes and models with a fair bit of technical and historical information thrown in for good measure. We think the effort was worth it because it now means we can present information in a range of different ways. Keep an eye out for more developments in the near future. He's done it again! 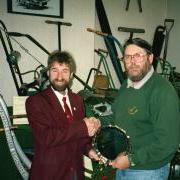 Club Member Brian Radam who runs the British Lawnmower Museum in Southport will be appearing on various BBC TV shows over the coming months (and on a TV channel in China). According to the report in his local paper, Brian has recently been recording for three BBC programmes. One of these is a new "people show" which features members of the public with unusual talents (we assume it's something to do with mowers) and one is the new series from the team that made "The Boat The Guy Built" but this time recreating some more Victorian inventions. And finally, with his colleagues from the mower museum Brian will also be appearing on the Egg Heads quiz show. Oh, and he's also recorded something for Chinese TV about the history of the mower. We wonder what they will make of it over there? The photo shows Brian on the left receiving the Club's Andrew Grout Trophy from Robbie Robinson some years ago.